It's Time To Wake Up - A Place for Those Interested in Maintaining Their Spiritual Awakening! NOTE: Clicking on a book or CD cover or link below will take you to that book or CD on Amazon.com where you will find the list price, the price you will pay, how many $$$ you will save, how fast you can get it and if you choose, you can add it to your shopping cart and purchase the book or CD. Shopping online with Amazon.com is 100% safe. GUARANTEED. Special book shelves featuring the books of Deepak Chopra and Wayne Dyer! A Course In Miracles (3 Vols in 1) - Foundation of Inner Peace - When Helen Schucman, a professor of medical psychology at Columbia University, began hearing an inner voice of rapid dictation, she decided to start taking shorthand notes. 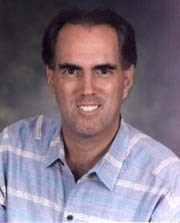 The result is A Course in Miracles, a book that has spawned hundreds of study groups and an international following. It focuses on the principles of universal love and forgiveness. 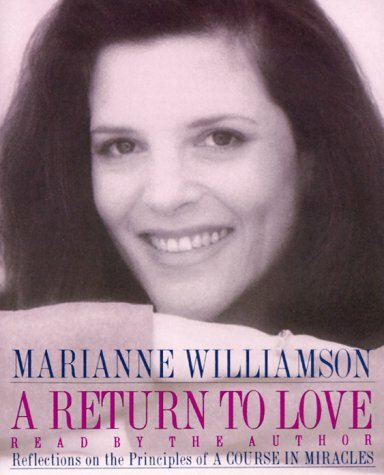 A Return to Love: Reflections on the Principles of a Course in Miracles - Marianne Williamson - This mega-bestselling spiritual guide in which Marianne Williamson shares her reflections on A Course in Miracles and her insights on the application of love in the search for inner peace. Williamson reveals how we each can become a miracle worker by accepting God and by the expression of love in our daily lives. Click here for more books by Marriane. Inner Coach, Outer Power - Keith Varnum - You possess amazing creative powers to heal your body and attract phenomenal abundance. And you have a built-in, inner guidance system to unlock your natural gifts with ease and wisdom. This book shows you how. Popular culture icons such as the "E.T." movie, Indiana Jones, and Mr. Rogers are offered as metaphors and reference points to guide you down the path to self-acceptance, self-improvement and higher fulfillment. Click here to contact Keith Varnum. God, Is That You? : How to Have a Conversation with God and Really Hear Him - Katharine C. Giovanni - Uplifting and anecdotal in nature, this nondenominational guide teaches people how to have a two-way conversation with God by offering examples of how to listen to His voice and how to respond with real words and sentences. It challenges people to listen to the voice of God in their everyday lives and to understand that they can hold conversations with God on a daily basis. The Book of Love: Awaken Your Passion to be Your Higher Self - Karen Bentley - This sheds practical and concrete light about how to be a more loving being. The reader is presented with an uncompromisingly spiritual system of love-based beliefs that are not linked to any organized religion. The ideas are uplifting, intelligent, and dramatically different. It asks the reader to stop dreaming and wake up. Love Is the Only Answer - Joan Marie Ambrose - Since the beginning of time, volumes and volumes of poems, reflections, stories and movies have been written about LOVE... the expression and feeling of love... yet, its true essence seems to elude most of us. Allow this CD to assist in uncovering the love that is inside of you. 8 Minute meditation and a 60 minute lecture program. Click here for a review of Joan Marie's book, "Hello. . . Is Anybody Listening?!" Forgiveness - Healing Meditation - Joan Marie Whelan - This CD is a powerful and dynamic guide to the boundless possibilities that exist as you release the old and connect with the abundance of the universe. The focus is on forgiveness and healing. The Journey of Life Eternal - Bahram R. Shahmardaan - This book is an Indispensable Guide to living a Spiritual Life and completing the Journey of Life Eternal, thereby achieving our Spiritual Heritage. 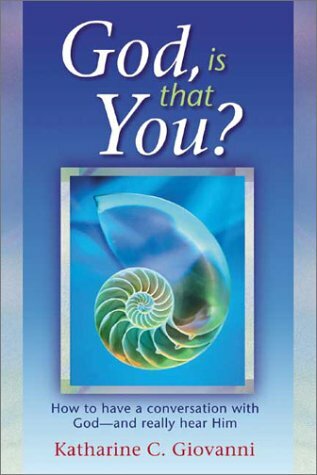 Step-by-step instructions reveal what each one of us has to do to get in touch with the spiritual self within and be enabled to live an integrated life based upon one's true nature. Some of the spiritual principles shared have never been revealed before and for the first time all the spiritual principles have been integrated and codified so as to be easily understood and practiced. 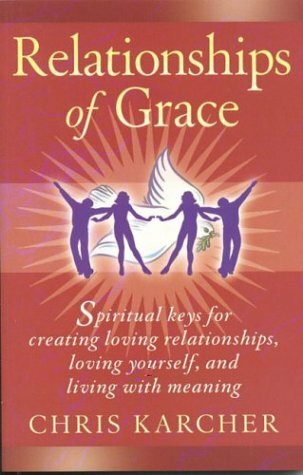 Relationships of Grace: Spiritual Keys for Creating Loving Realtionships, Loving Yourself, & Living With Meaning - Chris Karcher - An effective spiritual self-help guide to creating healthy and loving relationships that spiritually reward us while spreading the power of faith in God as well as the joy and miracle of sharing happiness together. Secrets for dealing with difficult people, timeless spiritual teaching, the importance of loving oneself, opening one's heart and mind to grace and God, and more fills the pages of this reverential and deeply meaningful guide to positive change. View Paul Ghezzi's Potential Movie! It is shifting perceptions all over the world! 2. Next, take a look at a wall near you. Any smooth, single-colored surface will do. 3. You will see a circle of Light developing. 5. Who do you see? View the beautiful, calming, animated presention, "Right Now" by Ralph Marston. Read, "Principles of Being" by Austin Vickers, Guest Author.